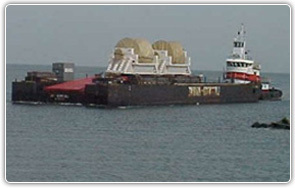 Lockwood Marine serves the U.S. East Coast, Gulf of Mexico, Great Lakes, Caribbean and the Mississippi River system. With our fleet of ABS classed All-Ocean deck barges, we have the capability to sail in both inland and international waters. Combined with the rigging expertise of Lockwood Brothers, Lockwood Marine has the technical ability to design turnkey marine projects for our customers including the engineering, loading and securing of cargoes onto our barges for shipment. With our knowledge and ties in the marine industry, we are able to provide our customers with multiple transportation service options covering virtually every U.S. port to develop the most efficient and cost effective move available. A consistent high performance level and a well designed move results in a happy customer. This is why Lockwood Marine enjoys a loyal customer base and a 90% repeat business rate. We look forward to speaking with you today about your upcoming move. Please give us a call.